Zwelidumile Jeremiah Mgxaji is better known as Dumile Feni. As a child Dumile developed an interest in carving and drawing and in the early 1960s he was apprenticed briefly to the Block & Leo Wald Sculpture, Pottery and Plastics Foundry in Jeppe, Johannesburg. He received no formal art Training but while being treated at the Charles Hurwitz South African National Tuberculosis Hospital (SANTA) in Johannesburg in 1963 and 1964, his obvious artistic talent was encouraged by the artist Ephraim Mojalefa Ngatane (qv. ), who was only slightly his senior but had already exhibited successfully at the Adler Fielding Gallery in Johannesburg. The two painted murals at the hospital and Dumile decided that art was his vocation. After his discharge, Dumile received informal training from Ngatane who suggested that he go to the Jubilee Art Centre where he met Cecil Skotnes (qv.). He also received help and advice from Mrs Haenggi of Gallery 101 in Johannesburg and the artist, Bill Ainslie. Dumile exhibited successfully for a number of years in Johannesburg and was selected as one of the artists to represent South Africa at the 1967 Sao Paulo Biennale. However, he was severely criticised by his fellow artists in Durban, where he was living at the time, for being prepared to represent the apartheid regime on an international exhibition. On his return to Johannesburg and faced with the prospect of being deported to either Queenstown or Worcester under the notorious Pass Laws, Dumile decided to go into voluntary exile in London, arriving there at the beginning of 1968. In London Dumile again enjoyed success and recognition, showing his work among other exhibitions, at the Grosvenor Gallery and Camden Art Centre. In 1979 he decided to go to the United States, first to Los Angeles and then New York, where he spent the last decade of his life. Although Dumile did exhibit in New York, his income derived mainly from designing record covers, posters, calendars and illustrations in books. In 1991, shortly before his planned return to South Africa, he died from heart failure while shopping at his favourite music store, Tower Records in New York. His body was returned to South Africa and he is buried in Johannesburg. Described while in Johannesburg as the ‘Goya of the townships’, Dumile found his subject matter in the life and events he observed around him, but he had the ability and vision to transform the particular into the universal. His works reflect his deep love of music, particularly jazz. In many of his drawings, even the disposition of the figures on the page is invested with a musical rhythm. Dumile was primarily a graphic artist, working almost entirely in monochrome. He was also an exceptionally gifted sculptor and many of his drawings, executed entirely in a linear fashion, have a profound sculptural quality. The Study for the portrait of Albert Luthuli (plate 138) is an excellent example of Dumile thinking and expressing himself as a sculptor through drawing. The drawing does not attempt to depict the final three-dimensional sculpture; instead, the drawing itself has an intrinsic, sculptural quality. It was while he was in London that he started work on a sculpture of Albert Luthuli and eventually completed at least two bronzes of this African icon. Albert Luthuli (1898–1967) was a Zulu chief, teacher and religious leader; he became president of the African National Congress from 1952 to 1967, and was the first African winner of the Nobel Peace Prize for his efforts in waging a non-violent campaign against racial discrimination in South Africa. Portraits in the conventional sense do not feature much in Dumile’s work and this drawing of Luthuli and the completed sculptures are no exception. Rather than a naturalistic likeness, they are symbolic portraits of a great leader and a wise and noble man. Dumile succeeded in imbuing his work with feelings of deep sympathy and humanity. As Justice Albie Sachs has pointed out, Dumile’s work embodies the ideals and values which we cherish in a democratic South Africa and which are enshrined in our Bill of Rights. Born Worcester, Western Cape, c. 1939 –1942; died New York City, 1991. Training Feni was largely self-taught apart from an apprenticeship in a Jeppe foundry, but he was supported and guided by Ezrom Legae (qv. ), Bill Ainslie and Barney Simon. Selected Exhibitions 1963: Solo exhibition, Gallery 101. 1965: Transvaal Academy, Johannesburg. 1966: Invited artist, Durban Art Gallery; Republic Festival Exhibition, Pretoria; Artists of Fame and Promise, Adler Fielding Gallery, Johannesburg. 1967: One of the artists selected to represent South Africa at the Sao Paulo Biennale. 1969: Solo Exhibition, Grosvenor Gallery, London. 1975: African Art from South Africa, Gallery 21, London. 1977: Drawings by SA Artists, Iziko SA National Gallery, Cape Town. 1981: Black Art Today, Jabulani Standard Bank, Soweto. 1988: Voices from Exile – Seven South African Artists, touring the USA. 2001: The Short Century: Independence and Liberation Movements in Africa<, 1945–1994, Museum Villa Stuck, Munich, touring. 2005: Dumile Feni Retrospective Exhibition, Johannesburg Art Gallery, touring to the Oliewenhuis Art Museum, Bloemfontein and the Iziko SA National Gallery, Cape Town. Collections Iziko South African National Gallery, Cape Town; Johannesburg Art Gallery; De Beers Centenary Art Gallery, University of Fort Hare, Alice; Durban Art Gallery; Ann Bryant Art Gallery, East London. 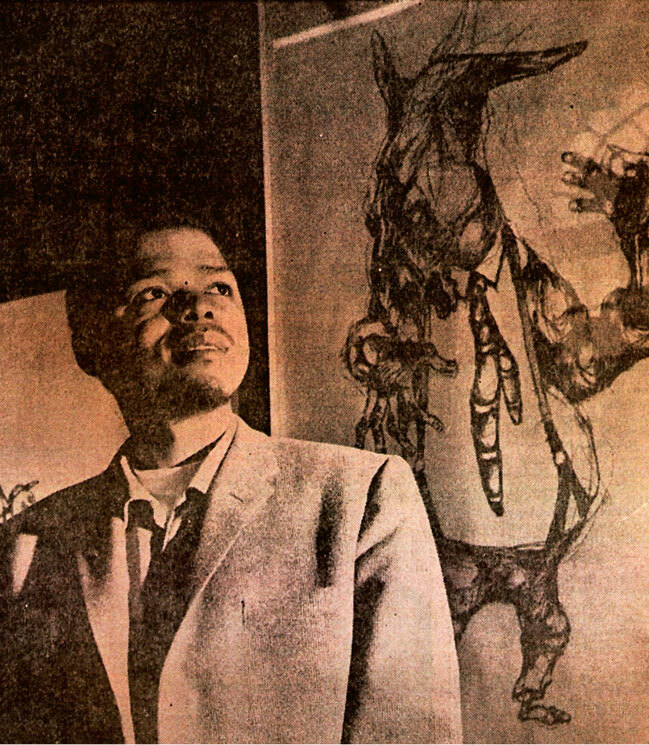 Dumile with one of his charcoal drawings, c.1969. Source: “Xhosa Artist makes good in London”. The Cape Argus, August, 1969. No page reference available. Photographer unknown. This small study in ink on paper by Dumile (plate 26) is a preparatory sketch for the larger drawing which he subsequently presented to the collection of the Iziko SA National Gallery (Fig. 4) and which has been exhibited internationally in recent years on major exhibitions.1 It was also shown on the Sao Paulo Biennale in 1967. Dumile’s image of a derailed train with its scattered victims has been read as a ‘symbol’ by one writer, who links it to another drawing by the artist entitled The Stricken Household.2 This drawing similarly shows the spread-eagled corpses of human victims, the casualties, he questionably implies, of a security force raid, although more likely, it must be argued, of a natural disaster.3 As in the case of Train Accident, he writes, ‘pure horror leaps out at the observer through a dark veil of hopelessness’. The two drawings, he concludes, are ‘symbols’, (preferably metaphors) for the uncompromising situation in which blacks in South Africa found themselves under apartheid. Another interpretation of the drawings of the train accident is however possible. The words ‘a friend’ are inscribed in the top left hand section of this much smaller drawing which suggests that Dumile had known someone who was killed in a specific train accident. There were a number of serious train disasters in South Africa in the late 1950s and 1960s. One at Woodstock in Cape Town claimed 18 dead and 72 injured in April, 1957. What seems to have been the worst train smash in South African history occurred at Cato Manor near Durban in 1965, resulting in 91 fatalities. This took place just a year before Dumile’s larger work now in the Iziko SA National Gallery collection was first exhibited. Given Dumile’s familiarity with Durban, and his temporary residence there, it is more than likely that this accident and the loss of his friend in it motivated him to produce these drawings. His unusual decision to present the large drawing to the Iziko SA National Gallery at this time may also have been motivated by his desire to offer it to a public institution as a permanent memorial to this deceased friend. However, no records at the Gallery found so far indicate this to be the case. For example: 2001: The Short Century: Independence and Liberation Movements in Africa, 1945–1994. Museum Villa Stuck, Munich, touring internationally. Ulrich Clewing. 2003. ‘The derailed train is a symbol’. Culturebase.net biography on Dumile Feni. http://www.culturebase.net/artist.php?886. Security force raids on informal settlements were not a feature of the 1960s, but rather of the 1980s.